In the in wake of this afternoon's trades, the Red Sox have temporarily called up outfielder Josh Reddick from Portland and reliever Marcus McBeth from Pawtucket. Diasuke Matsuzaka was placed on the 60-day disabled list and Pawtucket's Travis Denker was designated for assignment in a pair of concurrent moves. Reddick, currently the second ranked prospect in the organization by SoxProspects.com, is hitting .277/.352/.520 with 13 home runs, 17 doubles and 3 triples in 256 at-bats over 63 games with Portland in 2009. McBeth owns a 2-0 record and has recorded 3 saves in 34 appearances (1 start), allowing 13 earned runs of 31 hits over 51.1 innings pitched for a 2.28 ERA with Pawtucket in 2009. While some teams make a splash at the non-waiver trade deadline, the Red Sox just did a cannonball. DJ Bean of WEEI.com, citing multiple media reports, has confirmed that Boston has acquired slugging catcher Victor Martinez from the Cleveland Indians in exchange for pitchers Justin Masterson, Nick Hagadone, and Bryan Price. The 30-year-old Martinez is hitting .284/.368/.464 with 21 doubles, 15 home runs and 67 RBI in 377 at-bats so far this season, playing 52 games as a catcher, 47 at first base, and serving as the Tribe DH on 3 occasions. He is currently in the fifth season of a five-year, $15.5 million contract with a team option for 2010 that would pay him $7 million. Just a season removed from hitting a disappointing .278/.337/.365 with just 2 home runs, Martinez, a three-time American League All-Star, owns career .297/.369/.463 numbers with 103 home runs and 518 RBI in parts of 8 major league seasons with Cleveland. The Venezuelan switch-hitter was originally signed by the Indians as an international free agent in 1996. Masterson, a second-round draft choice by the Red Sox in 2006, is currently pitching out of the Boston bullpen. The 24-year-old righthander is 3-3 with a 4.50 ERA in 31 appearances for Boston, including 6 starts. Nick Hagadone was chosen by the Red Sox in the first supplemental round of the 2007 draft and had been plying his trade in the starting rotation for the Greenville. Just a year removed from Tommy John surgery, the 23-year-old lefthander was 0-2 with a 2.52 ERA and 32 strikeouts in 25 innings for the Drive. A 22-year-old native of Texas, Bryan Price was selected by Boston in the first round of the 2008 draft and had made 19 starts between Greenville and Salem this season. He was a combined 4-8 with a 4.67 ERA and 97 strikeouts in 96.1 innings. According to Tom Caron on NESN, the Red Sox have acquired Casey Kotchman from Atlanta for Adam LaRoche. As Kotchman strictly plays first base -- and the apparent point of unloading LaRoche would be to free up playing time at first base for Victor Martinez -- one might think that this could be a precursor to another deal, and that Boston might not be Kotchman's final landing place. Stay tuned. According to multiple reports, the Red Sox are on the verge of acquiring catcher/first baseman Victor Martinez from Cleveland. The Indians will reportedly receive Justin Masterson, Nick Hagadone, and Bryan Price. Stay tuned, more information is to come. The Red Sox today signed 2009 twentieth-round draft pick Alex Hassan and will assign him to the Lowell Spinners. The Milton, Massachusetts native was a two-way player for Duke this past season, both pitching and playing outfield. While Boston drafted Hassan as a pitcher, he will apparently get the opportunity to play some outfield in the Sox system this season. On the mound for the Blue Devils in 2009, Hassan appeared in 16 games and put up a 2-2 record with 8 saves and a 4.10 ERA, striking out 34 in 26.1 innings pitched. The tall righthander mixes in an 88-91 mph fastball, a low-70s curveball, and a change-up with a smooth delivery. The Sox followed Hassan this summer in the Cape Cod Baseball League, where he played for the Orleans Cardinals and appeared in the league's All Star game at Fenway on July 23. He sported a 1.13 ERA in 7 appearances for Orleans, including 4 saves and 8 strikeouts in 8.0 innings, and also put up a .289/.344/.395 line before leaving the Cape earlier this week to sign with the Sox . He leaves Duke tied as the school's all-time saves leader. The Red Sox drafted Stephen Fife out of Utah in the third round of the 2008 draft. Fife was a middle reliever to start his career at Utah but moved into the starting rotation for the 2008 season. As a starter, Fife developed a reputation as a work horse and gained a lot of draft momentum late in the summer. He came down with some weakness in his throwing shoulder to start the 2009 season and was held out of game action to start the year, but upon returning, he had a very successful stint with Greenville before moving up to Salem where continues to excel. Aaron Schwam of SoxProspects.com recently caught up with Fife to ask him a couple questions. Aaron Schwam: What was your draft-day experience like? Stephen Fife: I went home from college at Utah and spent draft day with family and my closest friends. We all got together at a local sports pub and watched the first round on ESPN and the rest via the internet on a big screen TV. I wasn’t sure where I would fall in the draft, but I thought I would go on the first day. We waited for names to pop up, and just before my name was announced my phone blew up with texts from my coaches at Utah and a few others. I reached for my phone and as I did, my name was anounced in the resturant and everyone went nuts. It was a day I will never forget. There were plenty of emotions from laughter to tears. It was a great day. AS: Were you surprised when you were picked by the Red Sox? SF: No, I was not surprised the Red Sox drafted me. (Red Sox Utah area scout) Matt Mahoney was my scout and he called me the day before the draft and we talked seriously about (the Red Sox selecting me in) the draft. When the third round started, I had a feeling that it was about my time and thought I would be selected by the Red Sox or the White Sox with the eighth or ninth picks in the round. I was ecstatic about being drafted by the defending World Champions and the Red Sox organization. AS: What are your developmental goals for this season? Have you set any for yourself or have the Red Sox laid out any for you? SF: I want to prove that I am a true 3-4 pitch starting pitcher. I worked really hard this off-season getting strong and working on my pitches, especially my change-up. The Red Sox want to see me improve my change-up and become precise with my curveball before I throw my slider. I am still working on those goals, and feel like I might be able to introduce the slider by the end of this season. My goals are the same as the organization's goals for me. I just want to develop by doing what they ask of me and I want to win. I think if I keep working on reaching their goals, promotions and success will come. AS: How would you describe each pitch and how you use them? SF: Yeah, as I was saying, they want me to throw three quality pitches and have command of those: a fastball (mostly a two-seam fastball with good sink), a curveball, and a change-up. I usually only throw my four-seam fastball off the plate to the glove side and when I want to elevate out of the zone. In a normal start, I use all three pitches and I have been pleased with my progression this season, especially with my change-up. AS: Which pitch do you feel is your best? How do you go about sharpening the pitches you need to work on? SF: Everything I do on the mound is based off my fastball and I feel that it is my best pitch, although my curveball and change-up have been great this year. I have been surprised with the success I have had with my change-up. I feel that I have developed a second strikeout pitch to go along with my curveball. I work on my fastball and change-up everyday while playing catch and doing flat-ground work. I throw my change-up from 90 feet with a crow hop after throwing my fastball from 90-120 feet. It helps me keep my arm speed up and find a feel with my front side. In side sessions, I just try to find a rhythm and pitch. Different days force you to make adjustments, so it's just a matter of recognizing the result you are getting with each pitch and making minor adjustments without over-analyzing. It can be difficult, but it comes down to me trusting myself to do what I know I can do. AS: What kind of MLB pitcher do you see yourself becoming and why? SF: I see myself as a starter. I like the five-day routine and feel that I have the mental and physical ability to get through a line-up multiple times in a game. I have heard from scouts and analysts that I could become a number three or four starter. That's what I strive to become, but I have also heard people project me as a closer because I have a good curveball. Only time will tell, but I see myself starting for a long time. AS: What has been the easiest/hardest part about transitioning to pro life in the minors? SF: The hardest has been adjusting to throwing everyday. In college, we had a couple days off and more days of rest. Getting into a strict five-day routine has been the biggest adjustment for me. The easiest part has been enjoying what I do. I love this game and enjoy everything about the Red Sox organization. My teammates and coaches, as well as the front office staff, have been awesome and made my experience great. The easiest thing to do for me is come to the park everyday and enjoy it. AS: Has any member of the organization made a positive impression on you and helped you get better? SF: Coach (Gary) DiSarcina and (Tom) Goodwin in Lowell have been great. We have talked a lot and I have learned countless things about this game from them. Bob Kipper in Greenville was a tremendous help to me as a pitcher. I try to listen to anyone who has done what I am doing and to take something from them that I can use at some point in my career. AS: Who is Stephen Fife? What do you like to do off the field? SF: I am just a hard-working kid from Boise, Idaho, who has been given a gift and is trying to make the most of it. I love this game and am very driven to get to the highest level. I am very competitive, but I enjoy having a good time with teammates and friends. Off the field I like to fish and golf and spend time with my buddies and family. I love the outdoors and don’t like to sit idle too often. AS: Bonus question: We've noticed you like to sport glasses on the mound. Is there any particular reason or story there? SF: I don’t have great vision due to astigmatism. I never had good luck with contacts and don’t mind wearing the glasses. I see 20/12 with them and that makes me want to keep them around. It’s nothing crazy, I just find them more comfortable and better than contacts. A strong start from Michael Bowden and 10 hits from the offense were not enough for Pawtucket, which fell to Buffalo 4-1. Bowden went the first 7.0 innings giving up only 1 run on 6 hits. He struck out 6 and did not walk a batter. Hunter Jones (2-3) did not fare as well, as he went the final inning giving up 3 runs on 2 hits and a walk to take the loss, although he did strike out 2. The top three hitters in the Pawtucket order, Brian Anderson, Travis Denker, and Chris Carter, each went 2 for 4, with Anderson netting 2 doubles and Carter collecting the Red Sox' lone RBI. In an even less impressive offensive performance, Portland managed just 3 hits and fell to Reading by a score of 2-0. Ryne Lawson (2-9) started for the Sea Dogs and allowed both Phillies runs on 6 hits and 3 walks in 5.0 innings, striking out 2. Tommy Hottovy relieved him and fired 2.0 perfect innings, striking out 3. Chad Rhoades finished things off with a scoreless inning of his own. Josh Reddick and Reid Engel each doubled for Portland, and Jorge Jimenez chipped in a single to account for all the offense the Sea Dogs could muster. Despite jumping out to an early lead and banging out 12 hits, Salem dropped a close one to Wilmington, 4-3. The first 5.0 innings of the night belonged to Kyle Weiland, who allowed 2 runs on 5 hits and 2 walks, striking out 3. Armando Zerpa (0-2) followed him to the hill and allowed 2 runs of his own on 3 hits and 2 walks, striking out 3 but taking the loss. Jose Capellan pitched a perfect inning to close things out, striking out 1. Kris Negron led the Red Sox offense with 3 hits in 5 at-bats. Zach Borowiak, Chih-Hsien Chiang, and Daniel Nava each had 2 hits, including a double and an RBI, while Mike Jones went 2 for 3 with a triple and an RBI. Greenville also got the lead early, but a 6-run Augusta seventh did the Drive in en route to a 7-3 loss. Continuing his fine season following his return from surgery, Nick Hagadone went the first 3.0 scoreless, hitless innings giving up 3 walks and striking out 2. Mike Lee (3-4) went the next 3.0 innings without giving up a run but ran into trouble in the seventh, when he was touched for 6 runs, giving up 5 hits to take the loss. He struck out 4 in all over 3.1 innings of work. Chad Povich pitched the final 1.2 innings and gave up a run of his own on 4 hits. Will Middlebrooks had another hot night at the dish, going 3 for 4 with a run scored. Casey Kelly also collected multiple hits, going 2 for 4 with a run scored as the Drive DH. Determined not to allow Sox affiliates to go winless on the night, Lowell once again downed Tri-City by a score of 8-4. Alex Wilson pitched 3.0 perfect innings to start the night, striking out 1. Tom Ebert wasn't quite as successful, giving up 3 earned runs on 2 hits and a walk in his 2.0 innings. Charle Rosario (1-1) was on the mound when Lowell took the lead, tossing 2.0 innings allowing 1 run on 3 hits, striking out 2 to earn the win. Michael Bugary struck out the side in a scoreless eighth, and Dennis Neuman struck out 2 in a scoreless ninth to preserve the win. With 3 hits, including a double, a triple, and 2 RBI, in 5 at-bats, Shannon Wilkerson led the Spinners offense. Derrick Gibson also went 3 for 5 and scored 2 runs, while Ronald Bermudez went 3 for 4. Drew Hedman went 2 for 4 with 2 doubles and 4 RBI. Player of the Night: Michael Bowden, who pitched 7.0 innings allowing only 1 run and striking out 6. The offense was once again disappointing as Pawtucket was blanked by Buffalo, 3-0. Enrique Gonzalez (7-9) went the first 6.1, giving up 3 earned runs on 5 hits and 2 walks, recording 1 strikeout while taking the loss. Javier Lopez got the next out, but not before giving up a hit and a walk. Randor Bierd bailed him out, closing out the seventh and pitching the eighth as well without giving up a run. He allowed 1 hit, walked 1 and struck out 1. Jeff Natale paced the Red Sox attack by going 2 for 3 with a double. Aaron Bates, Angel Chavez, and Gil Velazquez each went 1 for 3. Despite a valiant comeback attempt in the ninth, Portland fell to Reading 6-5. The Sea Dogs start went to Jarod Plummer, who went 5.0 innings giving up 3 runs (2 earned) on 6 hits and a walk, striking out 2. Ryne Miller (0-1) relieved him but took the loss, going 2.0 innings and allowing a solo home run to Reading first baseman Brian Stavisky, his second of the game. Bryce Cox went the final frame giving up 2 runs on 2 hits. Trailing by 3 runs going into the top of the ninth, Portland got within 1 on a 2-run home run by Jon Still (2 for 5), but couldn't quite complete the comeback. Jorge Jimenez also had a good game at the plate, going 2 for 4 with a double, a walk, and an RBI. Even with a stellar start by Seth Garrison, Salem fell to Frederick 1-0. Garrison tossed 7.0 shutout innings, allowing just 2 hits and 2 walks while striking out 7, departing with the score tied 0-0. Kyle Fernandes (4-1) relieved him and allowed the game-winning run on 2 hits and 2 walks to take the loss. Salem managed only 4 hits in the game, with no player netting more than 1. The Drive scored 5 runs in the final 3 innings to defeat Lakewood by a score of 6-5. Caleb Clay got the starting nod and went the first 5.0 innings, giving up 4 runs (3 earned) on 5 hits and 1 walk, striking out 4. Felix Ventura (2-4) pitched the final 4.0 innings giving up just 1 earned run on 2 hits, striking out 4 to earn the win. Zach Gentile led the Greenville offense with 3 hits in 4 at-bats, driving in 1 and scoring a run. Ryan Lavarnway went 2 for 4 with a double, a home run, and 2 runs scored, while Jered Stanley went 2 for 2 with 2 walks and an RBI. Kade Keowen also had 2 hits, going 2 for 3 with a double, and although Will Middlebrooks only had 1 hit in 4 at-bats, that hit was a go-ahead 2-run double in the bottom of the eighth. Good pitching and a balanced attack helped Lowell to an 8-2 drubbing of Tri-City. Ryan Pressly went the first 4.2 innings giving up a run on 5 hits and 3 walks, striking out 7. Richie Lentz (2-0) bailed him out of the fifth and went 1.1 perfect innings in all, striking out 3 of the 4 batters he faced to earn the win. Pedro Perez pitched the final 3.0 frames, giving up a run on 3 hits and a walk, striking out 3. Ryan Westmoreland went 2 for 3 with a double, 2 walks, 3 RBI and 2 runs scored, while Chris McGuiness went 2 for 5 with a double and 2 RBI of his own. Joantoni Garcia collected 2 doubles in 4 at-bats and scored 2 runs. Player of the Night: Seth Garrison, who pitched 7.0 shutout innings, allowing just 2 hits and 2 walks while striking out 7 in a losing effort for Salem. It was some good, some bad for Sox affiliates in Tuesday's action. In the Triple-A debut of Junichi Tazawa (0-1), Pawtucket fell to Buffalo 2-1. Tazawa went 6.0 strong innings, allowing 2 runs (1 earned) on 3 hits, but still took the loss. He struck out 3 and did not walk a batter. Marcus McBeth went the rest of the way, firing 2.0 scoreless, hitless innings including a walk and 2 strikeouts. The only multi-hit game for Pawtucket belonged to Chris Carter, who went 2 for 4, while Chris Duncan went 1 for 4 with a run scored. Bubba Bell's RBI ground out in the seventh plated the only run for the Red Sox. In Eastern League action, Portland annihilated Reading by a score of 12-1. Blake Maxwell (3-6) started and picked up the win with 5.0 innings of 1-run ball. Maxwell yielded only 3 hits and 2 walks, striking out 5 Phillies. Dustin Richardson was next to the bump, firing 2.0 scoreless innings of his own, allowing 1 hit and 1 walk with 3 strikeouts. Andrew Dobies and Chad Rhoades each tossed a scoreless frame to close things out. The Sea Dogs pounded out 15 hits, led by a 3-for-3 performance by Josh Reddick which included a double, and RBI, and 2 runs scored. Ryan Kalish and Jon Still each went 3 for 6 with a double and 3 RBI, while Juan Apodaca went 2 for 3 with a double, 2 walks and 3 runs scored. Ryan Khoury also had a multi-hit game, going 2 for 4 with an RBI. In a tightly fought contest, Salem lost a tough one to Frederick, 3-2. Stephen Fife went the first 6.0 innings, allowing 2 runs on 6 hits, striking out 5. Jason Rice kept the game tight with 2.0 scoreless innings, but Dave McKae (1-4) gave it up in the bottom of the ninth, allowing a run on 3 hits in 0.2 innings to take the loss. Luis Exposito went 2 for 3 with a walk, while Luis Segovia went 2 for 4 with a double and a run scored on a sacrifice fly by Che-Hsuan Lin (0 for 3) in the fifth. David Mailman drove in the other run for Salem with a ground out in the sixth. Greenville broke out the lumber to the tune of 12 hits, easily dispatching Lakewood 8-1. Getting the start and picking up the win was Brock Huntzinger (6-8), who went the first 5.0 innings allowing only 1 unearned run on 4 hits with 8 strikeouts. Mitch Herold went the next 3.0 innings giving up 4 hits and a walk but no runs, and Jason Blackey tossed a scoreless ninth to end the game. Eight Drive hitters had at least 1 hit in the game, led by Will Middlebrooks, who went 2 for 4 with 2 home runs and 4 RBI. Ryan Lavarnway went 2 for 4 with a home run and 2 RBI of his own, while Zach Gentile went 3 for 4 with a run scored. Jered Stanley went 1 for 3 with a double, a walk, and 2 RBI. The Spinners couldn't keep the good times rolling, dropping a 9-3 decision to Tri-City. Kason Gabbard (0-1) got the start, got roughed up, and took the loss, giving up 5 runs on 6 hits and 3 walks in 4.1 with 2 strikeouts. Kyle Rutter finished off the fifth with 0.2 scoreless innings, but not before giving up 2 walks. Cesar Cabral went the final 3.0 innings, giving up 4 runs (3 earned) on 6 hits and 2 walks, recording 1 strikeout as well. Lowell did manage 8 hits in the game, including a 3 for Chris McGuiness, 2 of them doubles. Wilfred Pichardo had a double and a triple of his own in 4 at-bats and scored a run, while Ryan Westmoreland and Derrick Gibson each went 1 for 5 with an RBI. Player of the Night: Will Middlebrooks, who went 2 for 4 with 2 home runs to help lead the Drive to victory. The Red Sox drafted Alex Wilson in the second round of this season’s draft out of Texas A&M. Wilson first pitched two seasons with Winthrop before transferring to Texas A&M, but underwent Tommy John Surgery and missed all of the 2008 season. Back on the mound in 2009, Wilson began the season in the starting rotation but moved into the bullpen to finish off the year. Making his professional debut with Lowell this summer, Wilson has been working in the Spinners’ starting rotation and having good success. Recently, Chris Mellen of SoxProspects.com had a chance to catch up with Alex prior to a game in Lowell. Chris Mellen: First off, welcome to the organization and congratulations. What was that draft-day experience like for you? Alex Wilson: Long! It was one of those days that I had been waiting for a full year now after being drafted last year and not having it work out with the Chicago Cubs. (tenth round pick in 2008, but did not sign) After that, I kind of put my head down and decided to grind it out to have the best year I could. I worked as hard as I could everyday and it worked out. CM: Talk about this past season at Texas A&M. It was kind of a tale of two seasons as you went from the rotation to the bullpen. What was going on there? AW: I started the first eight games of the year and had some success early on. Towards the end of the year I moved into the ‘pen. It wasn’t because my arm was tired or anything like that- it was a better fit for me and the team at the time for me to move into the ‘pen. We had been having trouble holding leads in the middle and towards the end of the game, and they asked me if I would be okay moving into that role as it would be the best fit. I was okay with the move. I like to win. That is what I have always been about. Moving into the ‘pen was a new experience for me, but one that worked out well and we were able to have some success with it. CM: Obviously the Red Sox scouted you a lot prior to drafting you. How much contact did you have with them leading up to the draft? And when they called your number were you expecting it? AW: Actually, the year before I had come up to Fenway for a private workout the day prior to the draft (in 2008), so I got to meet everyone then and get a feel for who was behind the scenes. This year, I filled out some paperwork for them, and talked a lot to Jimmy Robinson (Red Sox Amateur Scout) several times leading up to everything. About two weeks before the draft I had a pretty good idea of where I was going to go, but to who was still up in the air. The night of the draft I got a call from Jimmy Robinson about ten minutes before they drafted me. It was kind of funny because I kind of thought I was going to go to Cincinnati a few picks after the Red Sox with the way things were going that night, so it was unexpected and a real nice surprise. CM: After everything going down and the Red Sox being the team to pick you, how tough of a decision was it to sign? AW: I knew from the onset that if this is what I wanted to do and to make a career of it that this was the year for me to go. I told them I wasn’t going to be a problem if they drafted me early enough and that I wanted to get out there to play, and get my career going towards the big leagues. CM: Tell us a bit about your repertoire. AW: I’m primarily a fastball and slider pitcher. My slider is definitely my out-pitch, but I like to challenge hitters with my fastball too. I feel like I can locate my fastball well by going to either side of the plate to set hitters up. My change-up is my weakest pitch right now. I’m still working on it, but it has been coming along a little bit. The last couple of starts I have been able to throw it early in the count when I have wanted to get ahead of some guys. It’s not spectacular right now, but it is something I want to work on using more in the future. CM: Talking a little more about your fastball: We’ve had you clocked around 92-93 MPH this season. Is this generally where you sit or is there a little more there? AW: Yeah, I’ve been more around there consistently recently. Coming off this past year without having a day off after rehab and now pitching a full season, my body has been telling me to slow down a bit. I have a few months left here and then I’ll be able to get some time off. I’ve been up around 96-97 before, and feel like I’ll be getting back around there after I get some time off and a break. CM: What is the main goal for you here in Lowell? What are you looking to get out of your first professional experience? AW: I’m trying to get a feel for the system and get comfortable in the starting role, pitching on every fifth day as opposed to about every seventh day in college or coming out of the ‘pen. I’m on a very strict schedule here and I am trying to get used to it. It has been coming along real well and I have been feeling comfortable. We’re taking it nice and slow this year after rehabbing along with throwing about 90 innings at school. They told me they were going to be patient and take it slow with me this year. CM: Is 2 or 3 innings the max? We’ve seen you around 30 pitches or so thus far. AW: I might get past 3 innings once or twice this year, but it is basically a pitch count of about 40 each outing. CM: In your short time here in Lowell and the system so far, who is a teammate that has impressed you so far? AW: Ryan Westmoreland. He’s a young kid who is a big, strong, fast, and athletic guy who leaves it all out on the field, along with being a fun kid to be around off the field. There are a couple of years of age between us, but he’s one of my better friends here in Lowell and he is fun to watch. He’s one of those guys you can’t help but like. CM: What are your plans for the off-season? Do you know if you’ll be around in the fall? AW: I don’t know for sure yet, but when I was drafted I was told to be ready to be around for Fall Instruction. So, whatever happens, when I am done I am going to head back to Texas and start to workout. CM: What is the plan going forward? Starting or relieving? AW: The biggest thing for me right now is to get a better feel for my change-up and have some better control with it. Getting a feel for the pitch is only going to benefit me going forward. That’s what I am trying to work on here and that is going to be a key addition this off-season. Moving forward, I have been told to expect to stay as a starter and that is where I’d like to be, so I’m working on doing that. Lowell's Ryan Westmoreland continued to make a name for himself, posting a .276/.364/.789 line with 4 home runs and 1 triple in 33 plate appearance over 7 games last week, and taking SoxProspects.com Player of the Week honors for July 20-26. Westmoreland also scored 9 runs while batting in 7 and stole three bases. In his professional debut, Westmoreland owns a .276/.377/.496 line with 6 home runs, 6 doubles, 2 triples and stolen 11 bases over 127 at-bats in 33 games with Lowell in 2009. 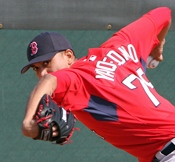 A fifth round pick in the 2008 draft, Westmoreland, 19, is currently the sixth ranked prospect in the organization by SoxProspects.com. Portland's Felix Doubront made the most of his single start last week, pitching a 7 inning complete game shutout at New Britain (Twins) July 22, allowing 4 hits while striking out 10 and walking none en route to the win and SoxProspects.com Pitcher of the Week honors for July 20-26. Doubront, a 21-year-old lefty out of Venezuela, is 6-3 with a 3.54 ERA in 19 starts with the Sea Dogs in 2009, allowing 33 earned runs on 84 hits over 84 innings pitched, striking out 77 while walking 38 and holding opposing batters to a .251 average. He is currently the thirteenth ranked prospect in the organization by SoxProspects.com. According to Boston.com's Nick Carfardo, the Red Sox have acquired outfielder Brian Anderson from the Chicago White Sox in exchange for Mark Kotsay, just four days after designating the veteran outfielder for assignment. A first-round draft choice (fifteenth overall) by the White Sox in 2003, Anderson has hit .225/.288/.364 in parts of five seasons with Chicago, including a .238/.322/.319 line with 2 home runs and 13 RBI in 185 at-bats this season. In parts of five seasons in the White Sox minor league system, the right-handed Arizona native has managed .293/.362/.474 totals with 40 home runs and 179 RBI in 1179 at-bats. Anderson will assigned to Triple-A Pawtucket. 7/28 Cup of Coffee: Monday was not a very good day for Sox affiliates as only the Gulf Coast rookie team earned a victory. Columbus edged Pawtucket 4-3. Kris Johnson threw 5 scoreless innings allowing 2 hits and 3 walks. Jose Vaquedano pitched an inning and gave up a run on a hit and a walk. He had a strikeout. Javier Lopez tossed an inning and gave up 3 runs on 3 hits and a walk. TJ Large threw 2 scoreless innings allowing a hit and 2 walks. He struck out 1. Ivan Ochoa went 2 for 5 and scored 2 runs. Mark Wagner went 2 for 4. Reading downed Portland 4-3. Felix Doubront went 5 innings allowing 3 runs on 4 hits and 4 walks. Chris Province threw 2 innings giving up a run on 2 hits. He struck out 4. Tommy Hottovy pitched a scoreless inning giving up a hit. He had a strikeout. Josh Reddick went 2 for 4 and scored a run. Juan Apodaca went 2 for 3 with a RBI. Frederick defeated Salem 4-3. Eammon Portice threw 5 innings giving up 3 runs on 4 hits and a walk. He fanned 3. Armando Zerpa tossed 2 innings allowing a run on 2 hits and a walk. He struck out 2. Derrick Loop pitched a clean inning striking out the side. Daniel Nava went 2 for 4 and scored a run. He is now hitting .366. Anthony Rizzo went 2 for 4 with a home run and 3 RBI. Lakewood downed Greenville 3-1. Stolmy Pimentel threw 4.1 innings giving up 3 runs on 4 hits and 2 walks. He struck out 5. Lance McClain pitched 3.2 scoreless innings allowing 1 hit. He struck out 4. Leandro Marin tossed a clean inning striking out 2 of the 3 hitters he faced. Jered Stanley went 2 for 4 and scored a run. Ryan Dent went 2 for 3 with a RBI. Tri-City downed Lowell 4-2. Jose Alvarez went 6 innings giving up 4 runs on 5 hits and 3 walks. He had a strikeout. Anatanaer Batista threw 2 clean innings striking out 2. Ryan Westmoreland went 2 for 4 and scored a run. Michael Almanzar went 2 for 3 with a run scored and a RBI. Sean Killeen went 3 for 4. In the only victory of the night for Red Sox affiliates, the Gulf Coast Red Sox edged the Orioles 3-2. Roman Mendez went 5 innings giving up a run on 4 hits and a walk. He had 5 strikeouts. Swen Huijer tossed 2 innings giving up a run on 2 hits. Cesare Angeloni threw a scoreless inning giving up 2 hits. Justin Erasmus pitched a clean inning recording a strikeout. Boss Moanaroa went 2 for 3. 7/27 Cup of Coffee: On Sunday, Pawtucket edged Columbus 3-2. Charlie Zink went 6 innings giving up 2 runs on 4 hits and 6 walks. Rocky Cherry threw 1.1 scoreless frames allowing a hit and a walk. Hunter Jones pitched 1.2 clean innings with a strikeout. Chris Carter went 2 for 4 with a RBI. Portland downed New Hampshire 8-3. Adam Mills started and went 5 innings giving up 3 runs on 5 hits and a walk. He struck out 2. Ryne Miller threw 2 scoreless innings giving up a hit and a walk. He had a strikeout. Chad Rhoades threw a clean inning fanning 2 of the 3 hitters he faced. Dustin Richardson tossed a clean inning recording 2 strikeouts. Josh Reddick went 2 for 5 with a RBI. Jorge Jimenez went 2 for 4 with a run scored and a RBI. Ryan Khoury went 2 for 3 with 2 runs scored. Juan Apodaca went 2 for 3 with a home run, 2 runs scored and 4 RBI. Potomac defeated Salem 6-4. Bryan Price went 5 innings allowing 2 runs on 5 hits and 2 walks. He had 6 strikeouts. Kyle Fernandes threw 3 scoreless innings giving up 1 hit. Robert Coello did not retire a hitter but gave up 2 runs on a hit and a walk. Josh Papelbon pitched an inning allowing 2 runs on 2 hits and a walk. He fanned 1. The Salem offense had 5 hits spread out among 5 different players. Lakewood downed Greenville 5-2. Fabian Williamson threw 3.2 innings allowing 4 runs on 4 hits and 3 walks. He had 4 strikeouts. Jeremy Kehrt tossed 4.1 innings giving up a run on 4 hits and 2 walks. He struck out 2. Chad Povich threw a scoreless inning allowing 1 hit. He had a strikeout. Zach Gentile went 2 for 4 and scored a run. Will Middlebrooks went 2 for 3. Lowell hammered Vermont 16-6. Yeiper Castillo went 5.1 innings giving up 2 runs on 5 hits and 3 walks. He fanned 3. Richie Lentz threw 1.2 scoreless, hitless innings. He gave up 1 walk and had 2 strikeouts. William Latimer pitched 2 innings giving up 4 runs on 4 hits and 2 walks. He struck out 3. Shannon Wilkerson went 3 for 6 with 2 runs scored and 3 RBI. Derrik Gibson went 3 for 6 with 2 runs scored and 2 RBI. Ryan Westmoreland went 2 for 4 with a home run, 4 runs scored and 2 RBI. Mike Almanzar went 2 for 6 with a run scored and 2 RBI. Ronald Bermudez went 2 for 5 with 2 runs scored and 4 RBI. In rookie ball, the Red Sox blanked the Twins 2-0. Randy Consuegra pitched 5 scoreless innings allowing 2 hits and 2 walks. He struck out 7. Kyle Stroup tossed 2 scoreless innings allowing 2 hits. He struck out 3. Jordan Flasher pitched a scoreless inning allowing 2 hits. He fanned 2. Dustin Mercadante threw a scoreless inning giving up 2 hits. He had a strikeout. Eddie Lora went 2 for 4 and scored a run. Felix Sanchez went 2 for 4 with a RBI. After dominating the Eastern League for the first four months of the season, Portland righthander Junichi Tazawa has been promoted to Triple-A Pawtucket, this according to Kevin Thomas of the Portland Press Herald. Tazawa, who signed a major league contract with the Red Sox during the off-season, was 9-5 with a 2.57 ERA in 18 starts for the Sea Dogs. The Japanese starter struck out 88 and walked 26 in 98 innings, holding opposing hitters to a .222 batting average. Tazawa had been especially good in July, going 2-1 with a 1.29 ERA in 4 starts, including 17 strikeouts and only 1 walk in 21 innings. The 23-year-old Tazawa, who was named an Eastern League All-Star but did not pitch in the game because he was also named to the World squad at the Futures Game, is currently the fifth-ranked prospect in the organization according to SoxProspects.com. In other news, the Red Sox also announced yesterday that Pawtucket outfielder Paul McAnulty was released to make room on the roster for the recently acquired Chris Duncan. McAnulty, who was hitting .233/.331/.402 with a team-leading 11 home runs and 48 RBI in 378 plate appearances, was signed as a minor league free agent following the 2008 season. 7/26 Cup of Coffee: On Saturday, Pawtucket outscored Columbus 13-11. Billy Traber went 5.1 innings allowing 4 runs on 9 hits and 3 walks. Javier Lopez pitched 0.2 of an inning giving up 2 runs on 4 hits and a walk. Marcus McBeth threw 2 innings allowing 3 runs on 2 hits and a walk. He struck out 3. TJ Large retired 2 batters but gave up 2 runs on 2 hits and a walk. Jose Vaquedano struck out the only hitter he faced to end the game. Jeff Natale went 3 for 5 and scored 2 runs. Chris Carter went 2 for 4 with a home run and 4 RBI. Aaron Bates went 3 for 5 and scored 2 runs. Travis Denker went 2 for 5 with a run scored and 4 RBI. Angel Chavez went 3 for 5 with 2 runs scored and 2 RBI. Ivan Ochoa went 2 for 5 with a home run and 3 RBI. Portland edged New Hampshire 4-3. Ryne Lawson started and went 6 innings giving up 3 runs on 4 hits and 4 walks. He fanned 1. Andrew Dobies pitched 2 clean innings of middle relief striking out 3. Bryce Cox pitched a scoreless final inning giving up 2 hits. He had a strikeout. Lars Anderson went 2 for 4 with a run scored and a RBI. Matt Sheely went 2 for 3 with a RBI. Potomac downed Salem 5-1. Kyle Weiland threw 4 innings giving up 4 runs on 6 hits and 2 walks. He struck out 3. Dave McKae went 3 innings allowing a run on a hit and a walk. He had 5 strikeouts. Jason Rice pitched 2 scoreless innings allowing a hit and 2 walks. He struck out 2. Anthony Rizzo went 2 for 4. Greenville defeated Delmarva 7-5. Nick Hagadone pitched 3 scoreless innings allowing 2 hits and a walk. He fanned 4. Michael Lee threw 4 innings giving up 5 runs on 8 hits and a walk. He had 4 strikeouts. Jason Blackey tossed 2 scoreless innings allowing 2 hits. He struck out 2. Zach Gentile went 2 for 5 with a RBI. Kade Keowen went 3 for 4 with a home run, 2 runs scored and 2 RBI. Lowell downed Vermont 5-3. Alex Wilson threw 3 scoreless innings giving up 1 hit. He had 4 strikeouts. Tom Ebert pitched 2 innings allowing a run on a hit and 3 walks. Charlie Rosario threw 2 innings giving up a run on 3 hits and a walk. He struck out 5. Kyle Rutter pitched 0.2 of an inning. He did not allow a run on a hit and 2 walks. He struck out 2. Michael Bugary went 1 inning allowing a run on 2 hits and a walk. He fanned 2. Dennis Neuman got the final out of the game with a strikeout. He also gave up a base on balls. Wilfred Pichardo went 3 for 5 and scored a run. Michael Almanzar went 2 for 5. Drew Dominguez went 2 for 4 with a run scored and a RBI. The Gulf Coast Red Sox took both ends of a doubleheader from the Rays. The Sox took the first contest 3-1. Manuel Rivera threw 5 innings giving up a run on 7 hits. He fanned 2. Justin Erasmus tossed 2 scoreless innings allowing a hit and a walk. He had 2 strikeouts. Juan Bonifacio went 2 for 4. Roberto Ramos went 2 for 3 and scored a run. The Red Sox took the second game 5-2 in a game shortened to 6 innings due to a lightning storm. Richard Wasielewski threw 4 scoreless innings giving up 2 hits and a walk. He had 4 strikeouts. Hunter Cervenka did not record an out but allowed 2 runs on 3 walks. Cesare Angeloni pitched 2 clean innings and had 2 strikeouts. Jose Garcia went 3 for 3 with 3 runs scored and a RBI. Moko Moanaroa went 2 for 2 with 2 RBI. 7/25 Cup of Coffee: On Friday, Columbus downed Pawtucket 3-1. Michael Bowden went 7 innings giving up 1 run on 4 hits. He struck out 5. Randor Bierd threw 1.2 frames allowing a run on 3 hits. He had 3 strikeouts. Hunter Jones retired the only hitter he faced. The offense had 3 hits spread out among 3 different players. New Hampshire blanked Portland 3-0. Jarrod Plummer pitched 5 innings giving up 2 runs on 3 hits and 3 walks. He had 3 strikeouts. Chris Province threw 2 scoreless, hitless innings giving up a walk. He had a strikeout. Dustin Richardson tossed a scoreless, hitess inning giving up 2 walks. He had a strikeout. Tommy Hottovy pitched an inning giving up a run on 2 hits. He had a strikeout. Ryan Kalish went 2 for 4. Salem defeated Potomac 5-1. Seth Garrison threw 6 innings giving up 1 run on 2 hits and a walk. He struck out 6. Armando Zerpa pitched 2 scoreless innings allowing a hit and 2 walks. He fanned 2. Josh Papelbon tossed a scoreless 9th inning allowing 2 hits. He had a strikeout. Che-Hsuan Lin went 2 for 4 with a home run and 2 RBI. Daniel Nava went 2 for 4 and scored 2 runs. Anthony Rizzo went 4 for 4 with a run scored and a RBI. Delmarva defeated Greenville 10-7. Caleb Clay went 4 innings allowing 6 runs on 6 hits and 3 walks. He fanned 3. Felix Ventura pitched 3 innings giving up 2 runs on 4 hits. He had 2 strikeouts. Leandro Marin threw 2 innings allowing 2 runs on 2 hits and a walk. He struck out 4. Zach Gentile went 2 for 5 with a RBI. Jered Stanley went 3 for 4 and scored 2 runs. Will Middlebrooks went 2 for 3 with a home run, 2 runs scored and 3 RBI. Pete Hissey went 2 for 4 and scored a run. Vermont downed Lowell 4-1. Ryan Pressly tossed 5 innings allowing a run on a hit and 3 walks. He fanned 4. Pedro Perez threw 2.2 innings giving up 3 runs on 3 hits and a walk. He struck out 3. Dennis Neuman pitched 1.1 clean innings and had a strikeout. Ronald Bermudez went 2 for 3 with a RBI. In rookie ball, the Reds shutout the Red Sox 3-0. Tyler Wilson pitched 2 innings giving up a run on a hit and 2 walks. He struck out 5. Pete Ruiz threw 5 innings allowing 2 runs on 6 hits and a walk. He fanned 4. Swen Huijer threw a scoreless inning allowing 1 hit. He struck out 2. Reymond Fuentes went 2 for 4. Nick Carfardo of Boston.com is reporting that the Red Sox have placed first baseman / outfielder Mark Kotsay on waivers to make room on the 25-man roster for the recently acquired Adam LaRoche. Kotsay originally came to Boston in a trade on August 2, 2008 in exchange for outfielder Luis Sumoza, hitting .226/.286/.345 in 22 games after arriving. Kotsay resigned with the Sox during the offseason, and in 27 games and 74 at-bats in 2009, he hit .257/.291/.324 with 1 home run and 5 RBI after getting a late start to the year following back surgery in late January. If he is not claimed by another team within 48 hours, the Red Sox can either release him outright or send him to the minor leagues. A member of the Red Sox organization since June 2002, only six other current Sox have been in the system as long as Jose Vaquedano (Tim Wakefield, Jason Varitek, Manny Delcarmen, Dusty Brown, Kevin Youkilis, and Charlie Zink). Born in Honduras, Vaquedano’s family moved to Texas when he was young, and he played junior college ball in the Lone Star State at Vernon College before being drafted by the Sox in the 35th round of the 2002 Draft. Now in his eighth year as a Sox minor leaguer, Vaquedano has started, relieved, changed arm slots, played for seven different affiliates at five levels, while also pitching in the Arizona Fall League and the Puerto Rican Winter League. Chris Hatfield of SoxProspects.com got a chance to chat with Vaquedano in Pawtucket after he recently returned from pitching in the Triple-A All-Star Game in Portland, Oregon. Chris Hatfield: You’ve got one of the longest tenures in the system. Over the time you’ve been with the Red Sox, how have things in the organization changed? Jose Vaquedano: I think the main thing is the players that they draft. When I first got drafted, there really weren’t that many [Major League] prospects [in the system]. All we really had was Hanley Ramirez – but now they’re everywhere from Lowell to Pawtucket. CH: So have you noticed that the teams you’ve been playing on are any better? Is it better to play with guys who are more talented? JV: Yeah it is. It’s fun to win. If I were ever to get that chance to go up to Boston, I now have experience with winning. CH: This season, you’ve really been able to put things together, making the Triple-A All-Star Game. Have you changed anything, or are things just clicking for you? JV: I think it’s a little bit of both. One big part is that I’m getting lefties out this year. I’m throwing my changeup for strikes, working lefties in and out. I’m throwing a lot more strikes this year too. CH: I mentioned that you got a chance to pitch in the Triple-A All-Star Game. What was it like to get named to the team and how did you hear that you had been selected? JV: I was a late addition, so I heard about it two days before I went out there, but it was a great experience for me, and I learned a lot. It was my first All-Star Game, so I was very excited. CH: In 2007, you changed your arm slot. What was it like switching your arm slot, changing your mechanics pretty much from step one, and how was that idea brought to you? JV: It was two days before Spring Training was over. [Director of Player Development Mike] Hazen and [Minor League Pitching Coordinator] Ralph Truel brought me into their office and said they liked me and that “we still think we can get something out of you.” So they brought up dropping down, and I went along with it. My agent told me, “yeah, do it with your heart.” So I went out there and did it, and I got accustomed to it kind of quickly. CH: Really? So you felt that it maybe “clicked” in that first year? JV: Well, last year a little bit, then I got to Triple-A and had a little struggle here and there, but yeah, I feel real comfortable in that this year. CH: Another change you’ve gone through coming up through the system is going from starting to the bullpen. How have you changed your approach to pitching, your routine, and how did you adjust to that change in general? JV: As a reliever, you’ve got to come in there throwing strikes. And I do like being a reliever a lot better. JV: I don’t know. Just the thought of waiting four days to pitch. I was always thinking ahead (to my next start). CH: So it’s knowing you could be needed at any moment? JV: Right. It could be every day, so I don’t mind that. CH: Coming up through the minors, what jump did you find to be the toughest? JV: I’d say from High-A to Double-A. When I made that jump, I was dealing with a lot of adversity, like changing my arm-slot, trying to do something new every day. I was walking people and I wasn’t throwing strikes. When I got to Triple-A, I was a little more mature. CH: Talk a bit about your approach to pitching. You’ve mentioned working the changeup to lefties, how else do you use your pitches, and what are you throwing right now? JV: I’m throwing a sinker, a slider, and a changeup. I tend to work mostly middle-in to righties – I try to get the sinker in on their hands – and sliders away. To lefties, I throw pretty much every pitch, work in and out, changeups and sliders. CH: Now you mentioned that your approach is something you’ve perfected this year? JV: Yeah, I went to Puerto Rico, and I learned a lot of stuff over there, like how to pitch sidearm – I was tutored by Pedro Feliciano, the sidearm lefty from the Mets. He really helped me a lot. He taught me what side of the rubber to pitch from, some tricks that he does. Of course, I took it all in, because he’s been pitching in the big leagues for seven years. CH: I was actually planning on asking you about your experience pitching in the Puerto Rican Winter League. How was the experience different pitching in the Caribbean Leagues over the winter than it is pitching in the minors in the U.S.? JV: It’s a lot different. Over there they want to win, so my job is to pretty much throw every day and get some righties out. Over here, in the minors, it’s not really about situational pitching, changing pitchers at the end of games like in the big leagues. JV: My arm holds up well. Ever since I dropped down, I can pretty much throw every day. It’s not really sore the next day. CH: You have pitched at seven different spots in the Sox’ farm system, due to franchises moving. Which place that you’ve pitched was your favorite? JV: I’d say Portland. The fans, the city, it was real laid back, and the fans were awesome. CH: Now, you were born in Honduras, not exactly a country that’s producing Major Leaguers left and right. What’s the baseball culture like there and how did you pick up baseball? CH: So when you moved when you were 11, was that to San Antonio? (JV: Yes.) So that’s how you wound up at Vernon College? (JV: Yes.) When you were there, was playing in the pros really on the map? JV: No, not really, because I never really was that dominating of a pitcher in high school or junior college where scouts were coming to talk to me. But the Sox came up and I went to a pre-draft workout, and they asked, “if we draft you, will you sign?” and I said, “yes.” So they were really the only team that was interested. And now I’m here. CH: Do you still have a lot of family down in Honduras? JV: Yeah, I went down there last year before I went to Winter Ball. I try to go there every two-to-three years, and I do have uncles and cousins down there. JV: I actually haven’t talked to my uncle, but I’ve been talking to my mom and she said it’s kind of bad right now. I have been keeping up with things, and I really didn’t like what the president was trying to do, so it was a good thing what they did. CH: One last question, or series of questions rather: You’ve played with a lot of players in the Sox’ system. Let’s do some quick name association. Most impressive teammate you’ve had coming up through the system? JV: Justin Masterson. Good guy, good team player, pretty much the nicest guy I’ve ever met. CH: Best clubhouse guy, humor-wise? JV: I’d say Manny Delcarmen. He’s a jokester. CH: Or is it you? I’ve heard you joke around a bit yourself. JV: Yeah, I do, but not like Manny. CH: I’m sure you’ve seen the “Blame It on the Rain” video with Papelbon. That par for the course with him? JV: That was perfect, yeah. CH: You’ve named a pitcher, how about a hitter that’s impressed you on your way up through the system? JV: I’d say Jacoby [Ellsbury]. He pretty much dominated at Double-A. Every time he got on, he scored. He got a hit, he somehow scored, whether stealing bases or stuff like that. 7/24 Cup of Coffee: Thursday's action saw Pawtucket down Rochester 5-3 in 12 innings. Enrique Gonzalez went 7.1 innings allowing 2 rns on 3 hits and 2 walks. He struck out 6. Javier Lopez retired 1 hitter but gave up a run on 2 hits. Fernando Cabrera tossed 1.1 scoreless frames allowing 2 hits and a walk. He had a strikeout. Rocky Cherry threw 2 scoreless innings giving up 2 hits and 2 walks. Jose Vaquedano threw a scoreless inning giving up a hit and 2 walks. He fanned 1. Jeff Natale went 2 for 6. Ivan Ochoa went 2 for 5 and scored 2 runs. Mark Wagner went 2 for 6 and scored a run. Travis Denker went 2 for 5 with a RBI. Freddy Guzman went 2 for 5. New Britain edged Portland 1-0. Junichi Tazawa threw 6 scoreless innings allowing 3 hits and a walk. He struck out 5. Bryce Cox went 0.2 of an inning allowing 1 run on 3 hits. The offense produced 4 hits spread out among 4 different players. The second game of the doubleheader was postponed. Salem defeated Frederick 4-2. Stephen Fife threw 5.2 innings giving up 2 runs on 6 hits. He struck out 7. Robert Coello tossed 2.1 clean innings striking out 5. Derrick Loop pitched a scoreless inning allowing a hit. He had a strikeout. Mike Jones went 2 for 4 with a RBI. Jon Hee went 3 for 4 and scored 2 runs. Delmarva downed Greenville 13-8. Brock Huntzinger tossed 2 innings allowing 6 runs on 7 hits and 2 walks. He had 3 strikeouts. Lance McClain went 4 innings giving up 4 runs on 7 hits and 2 walks. He struck out 6. Mitch Herold pitched 3 innings giving up 3 runs on 4 hits and 2 walks. He had a strikeout. Mitch Dening went 2 for 4 and scored a run. Ryan Lavarnway went 2 for 5 with a run scored. Will Middlebrooks went 2 for 5 with a run scored and 4 RBI. Ty Weeden went 2 for 3 with a RBI. Vermont downed Lowell 5-2. Cesare Cabral went an inning allowing a run on 2 hits and a walk. Anatanaer Batista went 2 innings giving up 4 runs on 3 hits and a walk. Richie Lentz threw 2 scoreless, hitless innings giving up a walk. He had a strikeout. Michael Bugary pitched a scoreless inning allowing 1 hit. He had 2 strikeouts. William Latimer threw 2 scoreless frames allowing a hit and a walk. He fanned 1. Kyle Rutter tossed a scoreless inning giving up 1 hit. He had a strikeout. Ryan Westmoreland went 2 for 5 with a home run. Sean Killeen went 2 for 3. The Gulf Coast League Red Sox were not scheduled to play on Thursday. The Line: Through 27 games, Westmoreland has posted a .280/.393/.490 line with the Lowell Spinners, good for an OPS of .883. Since turning the calendar over into the month of July, he’s cracked 9 extra-base hits in 63 at-bats, including 4 home runs. Westmoreland has been disciplined at the plate as well, walking 19 times, and he is a perfect 8 for 8 in stolen base attempts. On July 15, he went 2 for 4 against Aberdeen, belting a long solo home run in the game. Westmoreland followed that up with a 2-for-4 effort against Williamsport July 18 and a 3-for-3 performance against State College July 20, including a triple and another solo home run. His .883 OPS ranks him sixth in the NYPL, and his 4 home runs currently have him tied for fourth in the league. The View: Westmoreland’s skills have come as advertised and he has been proving to be a player on the move. His excellent bat speed and strong wrists generate easy power to all fields. Westmoreland is able to wait on the ball and allow it to get deep on him before he unleashes his swing. This enables him to stay back as long as possible and power the ball to the opposite field on a line. Westmoreland has also shown excellent power into the right-centerfield gap when he gets the head of the bat out in front of a pitch. The ball jumps off his bat when he squares it up, and he has shown an early knack for getting the fat part of the bat on the ball. His swing is quick to the point of contact by driving his hands down through the ball, and he’s able to keep his hands inside the ball on tough inside pitches. Westmoreland’s plate patience and discipline have proven to be advanced for his 19 years of age, and he has worked deep into counts during most of his at-bats. He has struck out a bit, but these generally come when he is deeper into the count and on off-speed pitches down in the dirt. As a developing hitter, this is something that should improve for Westmoreland as he builds his experience against professional pitching. Grading out around a 70 for speed, he’s got the makings of an above-average base stealer as he learns to read pitchers and improves his technique. After having off-season surgery on his shoulder, Westmoreland has yet to debut in the outfield, which should come later on this summer. The Line: Spanning 94 at-bats, Navarro put up a line of .319/.373/.543 during his stay with Salem Red Sox, good for an OPS of .915. Since coming off the disabled list on June 19, he’s churned out 13 extra-base hits, including 9 doubles and 4 home runs, while only striking out 12 times during the stretch. Navarro drove in 5 runs via a home run and a double July 16 in a 2-for-5 performance against Winston-Salem, and went 2 for 4 with a run batted in against Frederick on July 21 in his final game with Salem. He was promoted to Portland on July 22. The View: Navarro missed the first couple of months of the season after having surgery to remove the hook of his hand (better known as the hamate bone), but he’s rebounded nicely since returning. A natural and smooth shortstop, his range and throwing arm are above average, enabling him to make difficult plays look easy. After working on some of his glove work and footwork around the bag, Navarro has become a lot smoother turning double plays and projects as an above-average defensive player at the major league level. On the offensive side of the game, he brings some pop to the middle of the diamond and profiles as a hitter who will pile up extra-base hits. Navarro has excellent bat speed and can turn anyone’s fastball around. Especially adept at turning on inside fastballs, his bat whips through the strike zone to produce a lot of balls on a line, and he hits with good backspin that points toward him, adding a little home run power down the line. Navarro has struggled with off-speed pitches in the past, but he has been improving on his recognition and cutting down on the wild swings on balls in the dirt. He does, however, need some development in his patience and discipline at the plate. With his recent promotion to Portland in the Eastern League, Navarro is going to be challenged to keep his over-aggressiveness in check and not let pitchers force him into chasing bad balls off the plate. He’ll have to make some adjustments in Double-A, but it’s nothing outside of his skill set and should come along once he gets into a comfort zone against a new set of pitching. A period of struggle could mark the beginning of his Double-A tenure given the tough pitching reputation of the Eastern League. With the recent trade of fellow shortstop prospect, Argenis Diaz to Pittsburgh, Navarro has climbed to the top of the organization’s depth chart at the shortstop position, and he has been fast tracked with an eye on getting a glimpse of his time-table to making an impact at the major league level. Felix Doubront continues to put together a solid season after surprising some with his Portland assignment to start the season. The 21-year-old left-hander has had a few rough patches, but as witnessed by his recent 7 shutout innings with 10 strikeouts against New Britian, the stuff is there with added consistency. Doubront has now struck out 77 batters in 79 innings on the season while allowing just 1 hit per inning and only giving up 5 home runs on the season. Doubront features a low 90’s fastball, a deceptive change-up that he turns over, and a mid 70’s curveball. His change-up has been an effective out pitch for him and complements his fastball nicely. Doubront’s poise and demeanor on the mound have drawn praise from scouts who have followed him during the season…After a tough start to the season, Salem righty Seth Garrison has put together a strong stretch of performances. Covering his last 52 2/3 innings, Garrison has only given up 15 earned runs and walked only 10 batters. After spending the 2008 season as the closer for the Lowell Spinners, he’s moved into a starting role with the Salem Red Sox this season and has begun to settle in after getting hit hard the first two months of 2009…Shannon Wilkerson, an eighth-round draft pick this year by the Red Sox, has settled in with Lowell and begun to show off his skills. The right-handed outfielder is now 26 for 91 on the season. Wilkerson has above-average tools across the board and has been coming up to speed with professional pitching after playing Division II baseball in college. Bryan Price continues to struggle with his fastball location since being promoted to Salem. The right-handed pitcher has now given up 57 hits in 41 1/3 innings and been tagged with 36 earned runs in that stretch. Price has been hit hard by left-handed batters and has generally been leaving his fastball in the middle of the plate. Considered his best weapon, his slider has also not been as sharp in outings, sweeping more across the strike zone and lacking the downward bite that would make it a plus pitch. Despite his velocity, Price’s four-seam fastball is on the straight side, and he can loose command of his running two-seam fastball at times. He’s yet to put together a couple of consistent outings to get himself in a groove…Mark Wagner has yet to hit his stride since his promotion to Pawtucket and is currently 6 for 37 to start his career at Triple-A…Charlie Zink has been hit hard in July. In his 4 starts this month, the knuckleballer has given up 21 earned runs in 17 1/3 innings while only striking out 2 batters. 7/23 Cup of Coffee: On Wednesday, Rochester took both games of their doubleheader against Pawtucket. The Red Wings took the first game 5-0. Kris Johnson started and threw 5.1 innings giving up 5 runs on 6 hitsand 2 walks. He struck out 3. TJ Large retired the only 2 hitters he faced. The PawSox managed only 2 hits in the game. Rochester took the second contest 6-1. Charlie Zink went 1.2 innings allowing 5 runs on 6 hits and 2 walks. Hunter Jones threw 2.1 innings allowing 1 run on 2 hits. He fanned 2. Marcus McBeth pitched 2 clean innings recording 2 strikeouts. The offense produced just 4 hits spread out among 4 different players. Portland took both games of their doubleheader from New Britain. The Sea Dogs took the first game 3-0. Felix Doubront threw a complete 7 inning game allowing 4 hits. He did not allow a walk and recorded 10 strikeouts. Josh Reddick went 2 for 4 with 2 RBI. Juan Apodaca went 2 for 3 with a run scored and a RBI. Portland took the second game 5-1. Blake Maxwell went 5 scoreless innings giving up 3 hits and 2 base on balls. He had a strikeout. Ryne Miller went 2 innings giving up 1 run on 2 hits. He had a strikeout. Ryan Kalish went 2 for 4 with a run scored and a RBI. Salem downed Frederick 8-5. Jose Capellan threw 3.1 innings giving up 5 runs on 7 hits and 5 walks. He had a strikeout. Kyle Fernandes tossed 2.2 scoreless frames allowing 2 hits and a walk. He had a strikeout. Jason Rice threw 2 scoreless, hitless innings allowing a walk. He struck out 3. Derrick Loop pitched a clean inning fanning 2 of the 3 hitters he faced. Daniel Nava went 3 for 4 with a run and a RBI. Kris Negron went 2 for 3 and scored 2 runs. Delmarva defeated Greenville 3-1. Stolmy Pimentel threw 6 innings allowing 3 runs on 6 hits. He struck out 6. Fabian Williamson threw 1.2 scoreless, hitless innings. He gave up 2 walks while striking out 1. Chad Povich threw 1.1 clean innings. The offense had 5 hits spread out among 5 different players. Lowell defeated State College 5-1. Kason Gabbard threw 3 innings allowing 1 run on 5 hits and 3 walks. He fanned 1. Jose Alvarez tossed 6 scoreless innings giving up 4 hits and a walk. He struck out 3. Chris McGuiness went 2 for 4 and scored a run. Ronald Bermudez went 2 for 4 with a run scored and 2 RBI. In the Gulf Coast League, the Red Sox downed the Orioles 15-3. Roman Mendez threw 5 innings allowing 1 run on 5 hits. He struck out 5. Kyle Stroup went 2 innings giving up 1 run on 2 hits and 2 walks. He had 2 strikeouts. Jason Blackey tossed a scoreless iinning giving up a hit. He fanned 1. Dustin Mercadante threw 1 inning giving up 1 run on 1 hit. Reymond Fuentes went 3 for 5 with 3 runs scored and a RBI. Casey Kelly went 2 for 5 with a home run. Carson Blair went 2 for 3 with 2 runs scored and 4 RBI. Eddie Lora went 3 for 5 with a run scored and a RBI. Player of the Night: Felix Doubront who threw a complete game 4 hit shutout. He did not allow a walk and had 10 strikeouts.